Reb'l Fleur by Rihanna is a floral fragrance for women. This scent opens up with a fresh burst of fruity peach, plum and red berries notes. With middle accords of tuberose, violet, hibiscus and coconut, Reb'l Fleur is a perfect combination of fruity and floral. The base notes of musk, patchouli, amber and vanilla add another layer to the fragrance, contrasting aromatic accords with floral and fruity notes flawlessly. Reb'l Fleur is the first fragrance brought out by Rihanna; it was inspired by the nickname given to her by her grandmother. The collection has a variety of products including perfumes, body mists and gift sets, allowing you to explore the floral scent in many different forms. Changing the game with her songs, fragrances and her make-up collection Fenty beauty, Rihanna knows how to make an outstanding debut in various industries. Reb'l Fleur by Rihanna was launched in 2011. I really like this one. One of my favourites to wear.it can be for day or night. I've tried 3 of the Rihanna perfumes and they have all been nice. I was very satisfied with my order. The dolivery was on time. The items was extremely well packaged and we had a friendly delivery man. 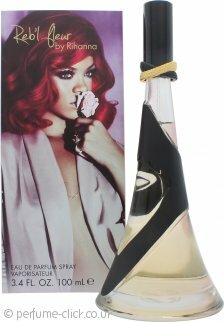 Rihanna Reb'l Fleur Eau de Parfum 30ml SprayPerfect for a night out! This is by far my favourite scent to wear of an evening - am always getting people ask me what perfume I'm wearing! Lasts a long time & can even still smell it on my clothes the next day! Love this perfume so i was excited when i found ht at such a price and fast delivery too! Very nice perfume have received many compliments when wearing it and lasts for hours. Rihanna Reb'l Fleur Eau de Parfum 100ml SprayGorgeous smell!! Rihanna Reb'l Fleur Eau de Parfum 100ml SprayDefinitely recommend to anyone. Love Love LOVE this Rihanna perfume!!! Smells absolutely gorgeous and will definitely be buying some more when I run out! Has that sort of 'dark side' to it which is what you would expect from Rihanna. Love it!